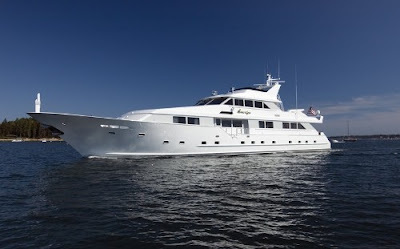 Refit in 2007, the 120' Broward Yacht, Sovereign is available for charter in New England/ R.I. and the Caribbean. On-deck Master: The Master Suite forward features an office/ lounge in the main entrance which can become private with separate door enclosure. Upon entering this full beam stateroom with plenty of natural light there is a King sized bed with adjacent hand painted closet doors and 42” flat screen TV. Audio visual system is state-of-the-art equipped with CD, DVD, and iPod docking station and window treatments provide black-out shading. En-suite individual his and her bath including walk in shower and Jacuzzi tub. *Each guest stateroom has en-suite facilities with walk-in showers plus personal robes and hairdryers. Satellite receivers are individual to each room and windows throughout provide full blackout shades.